Our annual members only barbecue will be held on at 2 PM on 17 August at Mike’s Housing Coop Meeting Rooms in Roberts Creek on 17 August 2014. 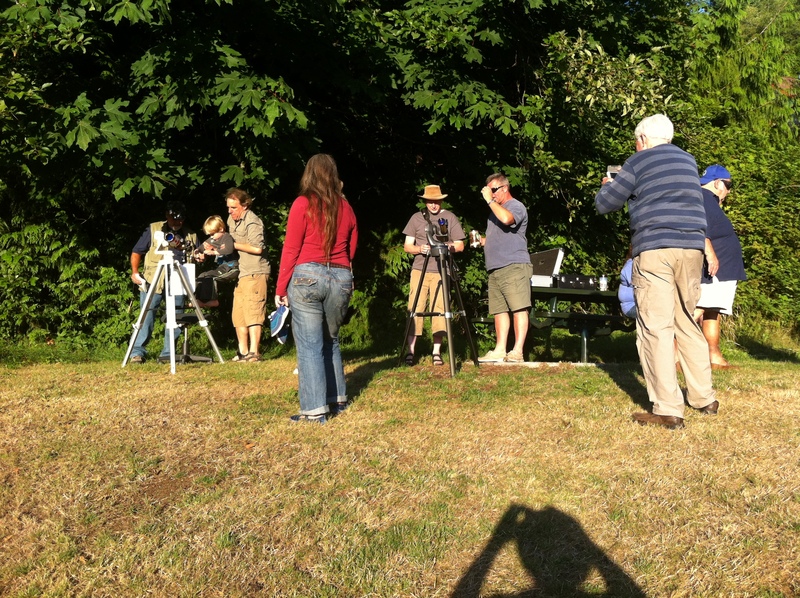 We’ll have the club’s solar scope there for viewing sun spots and solar flares. 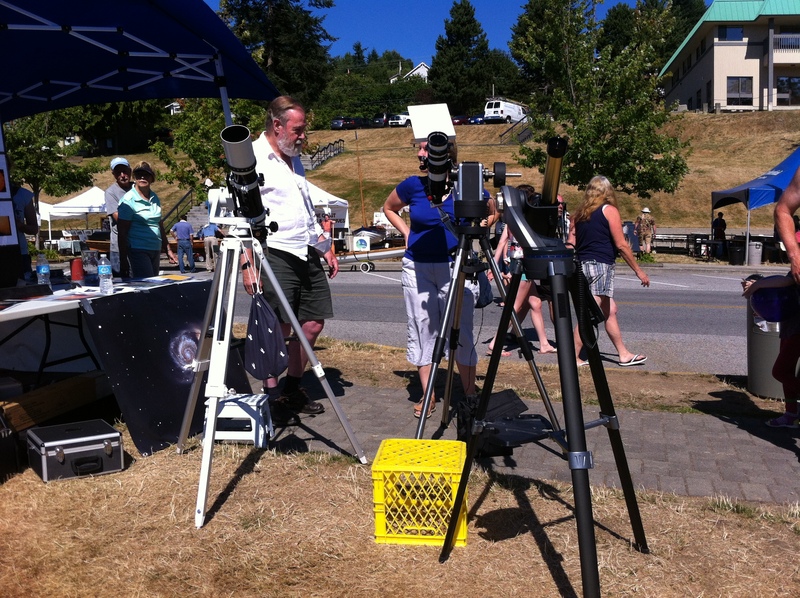 Mike, Scott, and I set up and manned our RASC booth at Gibsons Sea Cavalcade today. We had the solar telescopes functioning by 9 AM in Winegarden Park and had 100 people view solar flares and sun spots before the Cavalcade officially opened at 10. The sky remained cloudless and the sun obliged with multiple flares and sunspots. 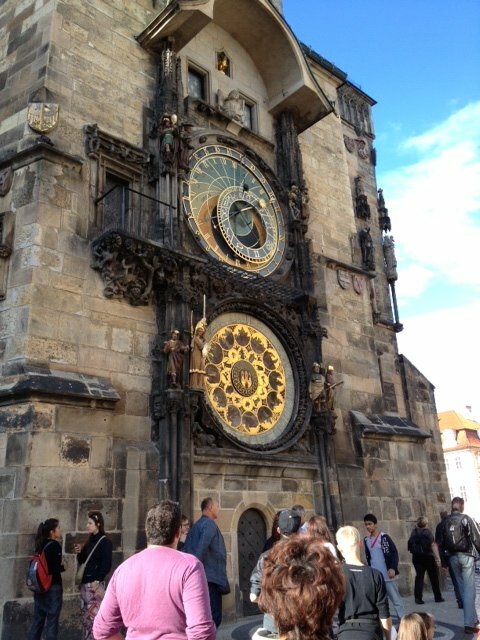 By closing time at 4 PM a total of 465 people viewed the sun through our scopes. Thanks to Errol for dropping by and assisting and for James and Stephen for dropping by to visit. Check out the photos for this event here. 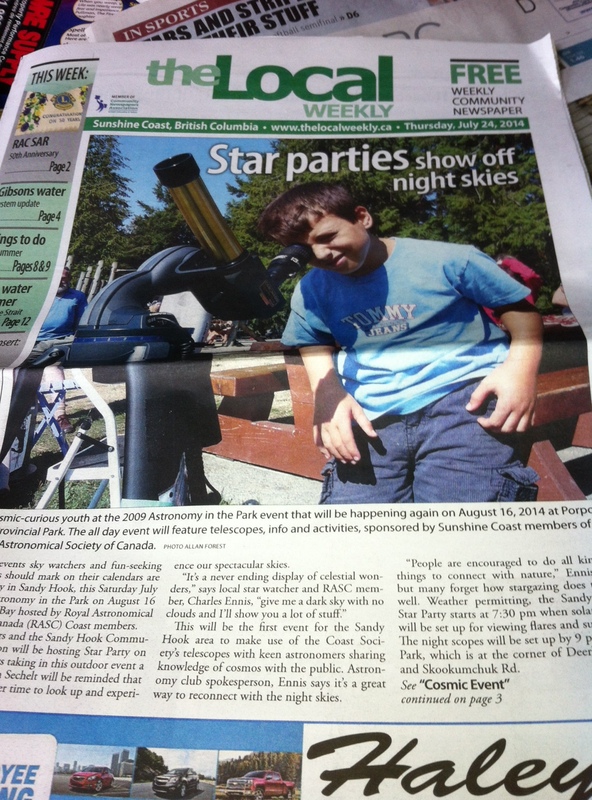 Our first Sandy Hook Star Party was a success. 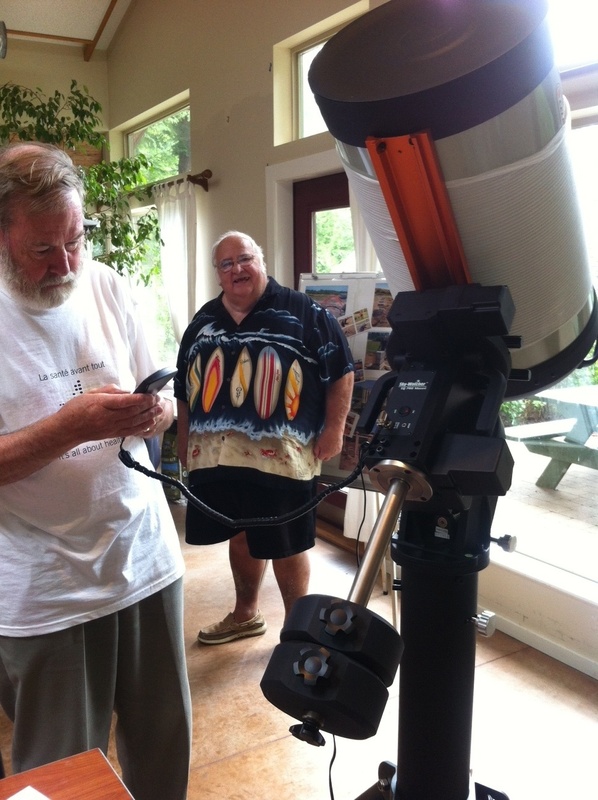 James, Bill, Mike, Danny, and Scott joined me at Tot Park with solar scopes and telescopes. 50 people attended including 2 Japanese exchange students. We had a clear sky and got good views of Saturn and Mars. Check out more photos of the event here. 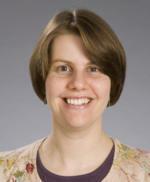 Dr. Stair’s work involves the observation of radio pulsars and their companions, with a general theme of studying binary pulsar evolution, and with sidelines in such areas as pulsar instrumentation and polarimetry, and some observations at other wavelengths. Pulsar Timing: Finding pulsars in surveys is only the first step in their study – the science comes out of long-term timing follow-up of these rapidly rotating neutron stars. Some of the particular objects Dr. Stairs follows include a young pulsar with a companion of 11 solar masses, for which she is trying to understand the orbital dynamics and the interaction between the two stars; a young pulsar that switches emission states; a “missing-link” pulsar/X-ray-binary system and several double-neutron-star binaries that allow stringent tests of general relativity. 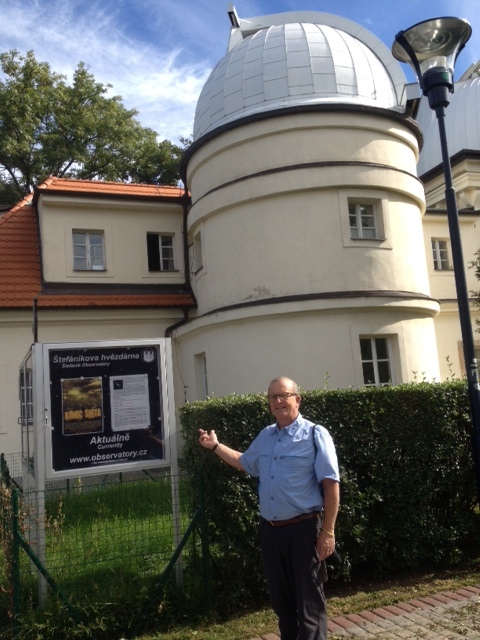 Dr. Stairs is also interested in trying to derive stellar masses and understand different evolutionary theories through long-term observations of pulsar–white dwarf binaries. A long-term goal, sought as part of the NANOGrav collaboration, is the direct detection of gravitational waves using multiple pulsars. Millisecond pulsars (MSPs) spin hundreds of times a second, emitting lighthouse-like beams of radio waves that we can monitor with large radio telescopes. An MSP spins so fast because it has been “spun up” by an evolving companion star, and in fact the majority of MSPs have been found in binary systems with white dwarfs (which the companion stars eventually become). Recently, we have found an MSP that is orbited by two white dwarfs instead of just one. This system must have had a rather unusual evolution. It allows for some precision work in a 3-body system, with the prospect of stringent tests of an aspect of Einstein’s theory of relativity. 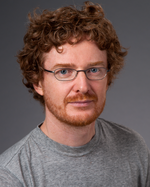 At 7:30 PM, 12 September, 2014, at the Sunshine Coast Art Centre, 5714 Medusa St., Sechelt, our speaker for the Sunshine Coast Chapter of the RASC will be Dr Ludo Van Waerbeke, an associate professor at UBC and a senior fellow of the Canadian Institute for advanced Research in the Cosmology and Gravity Program. Dr. Van Waerbeke will be speaking about Dark Matter and Dark Energy. The study of the universe is stumbling upon two mysteries: it is made of 5% of normal matter, 20% of an unknown type of matter, dark matter and for 75% of a puzzling form if energy, dark energy. Normal matter can be seen with traditional observational techniques that capture light at all possible wavelength with all kinds of telescopes. Dark matter can be detected indirectly with the gravitational lensing effect. The effect of dark energy can only be measured on the expansion rate of the Universe. Using a combination of observations of normal and dark matter and dark energy, Dr. Van Waerbeke’s research is a quest for a better understanding of the Universe and its fundamental laws, the large scale structures, galaxy clusters and galaxy formation.